Cyber-attacks are rapidly becoming one of the largest corporate risks that companies in all sectors face. From the loss of intellectual property due to corporate espionage to alarmingly common large-scale data breaches, it is clear that companies must do more to get ahead of threats and effectively manage risks. In response, companies have focused significant time, energy and resources to stop the threats posed by the attacks they face. This focus is for good reason. 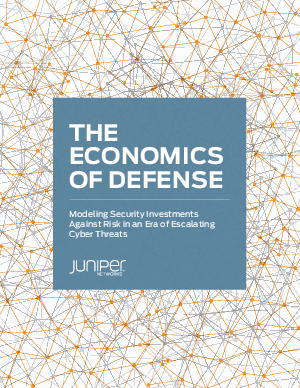 A Juniper Networkssponsored study from the RAND Corporation (RAND) last year, “Markets for Cybercrime Tools and Stolen Data: Hackers’ Bazaar,” found that attackers have organized cyber black markets that are now at unprecedented levels of economic maturity. In practice, these markets are making attackers much more efficient in penetrating corporate networks and providing greater profits. In fact, the research predicted that the ability to attack will soon outpace the ability to defend.